Black Friday UK 2019: when is it and what deals are coming? So... when is Black Friday 2019 and why should I care now? If you're wondering why people are talking about Black Friday already, it's because the date is coming up fast (the end of November) and the deals are likely to, once again, revolve around the big-ticket items of phones, tablets, laptops, cameras and (mostly) TVs... so you want to know whether to pull the trigger now or wait until later this year. The race to offer the best Black Friday deals is stronger every year, with brands extending their sales periods further and further to spread the sales out further - in the UK some even offer guarantees that if you buy earlier and the price goes down, they'll refund you the difference. Black Friday in the UK is quickly becoming the place to save money both in the build up to Christmas (to grab great bargains on presents) as well as actually stealing some of the yuletide sales thunder. In 2018 the sales growth in the UK was found in November - the BBC reported that Black Friday and Cyber Monday had ‘stolen’ sales from Christmas, with a spokesperson from the Office of National Statistics confirming that shoppers ‘snapped up more Black Friday offers’ in 2019. "Black Friday still represents the perfect time to find a bargain, both for yourself and for cheaper Christmas presents - so make sure you're prepared for what to buy"
Despite a tricky year, John Lewis also pointed to the Black Friday period as a point where it managed to see an increase in interest year on year - something that seemed to be borne out across the country, and we've been busy predicting the brand's efforts in our John Lewis Black Friday deals page. While footfall to bricks-and-mortar stores was down year on year, online traffic for Black Friday in the UK soared 46% year on year - the Brits loving bagging a deal from the comfort of a chair. That traffic was also nearly half the time on a phone - according to Picodi.com, 48% of online shopping came through a mobile in 2018, rather than in a store, and a further 11% on a tablet - and nearly a quarter of the year's transactions came through the month of November, showing Black Friday UK really is an online phenomenon. That’s in stark contrast to the US, where the notion of the ‘Doorbuster’, a sale that’s worth queuing for on Black Friday as it can only be found physically in stores, still prevails. Given Black Friday is as much about big-ticket items as anything else, and many will want to prep their year to plan for when to buy a new laptop, TV or iPad, we've pulled out the research to let you know precisely what to expect this year. Black Friday began as a US tradition started and is always the Friday immediately after the Thanksgiving holiday, meaning this year the Black Friday date is on 29 November 2019. As always, it’s the Monday immediately after Black Friday. So using all our fingers and two calendars, we’ve worked out that means Cyber Monday 2019 will fall on Monday 2 December. In reality there’s really very little difference between Black Friday and Cyber Monday nowadays. The two used to be quite distinct in terms of their capability for offering deals: Black Friday, being so soon after Thanksgiving, was the chance to shake off the turkey sweats and head to a retail store and wrestle with others to nab the advertised bargains. Cyber Monday, as you can imagine, is a more recent phenomenon that came with the advent of the internet - it traditionally marks the point where people realised they needed to get buying their Christmas presents and realised they’d better jolly well get on with it. Black Friday, in the US at least, was about electronics and other high-ticket items, where Cyber Monday more about lifestyle goods - but now they’re just one big smooshed-together buying period, and one that’s extending far beyond the bounds of that single weekend. How long does Black Friday last? We’re now seeing all manner of savings across multiple categories - last year John Lewis reported a boost in areas like fashion and beauty as categories where consumers snapped up big discounts, building on top of the big-ticket electronics items. However, the length of time that the sales lasted was the real story of 2018 - in the UK, most retailers started their sales far earlier than before to spread the load on their sites, leading to many UK consumers to wonder when Black Friday actually was, given there was no ‘day after Thanksgiving’ to hang a date around. This meant frantic Googling of ‘when is Black Friday?’ in a bid to make sure they didn’t miss out on bargains - which is why that’s one of the first things we’ve dealt with in this article. For consumers, the Black Friday / Cyber Monday sales frenzy means a whole fortnight - or even longer - of what appear to be good deals. If you’re savvy and take advantage of our Black Friday and Cyber Monday deals monitoring, you can really save a lot of money. As mentioned above, the fact that consumers focused in on Black Friday meant that Christmas sales fell as a result - so the discounts are only going to pile into that period as retailers follow the trends of when people are buying. Rhian Murphy, head of retail sales at the ONS, told the BBC: "Following the increased growth in November, where shoppers snapped up more Black Friday offers as they continue to bring forward their Christmas shopping, retail sales weakened in December". Given that we’re seeing such a shift towards an online presence, it means bad news for brick-and-mortar stores, where they struggle to compete with the deep discounts that can be offered online - and the bigger firms that offer cheaper postage to attract more clicks too. Will Black Friday 2019 be different in any way? 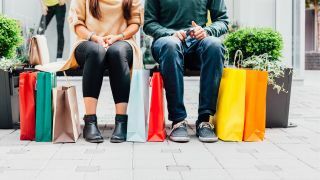 Black Friday 2019 could see more of a buying push in the UK though, as it falls later in the year - this means more people will have been paid when the buying weekend rolls around and could be willing to spend a little more on gifts. Headphones were among the big winners, with Apple’s Airpods desperately sought after on both sides of the Atlantic. In the UK we saw a few big price drops (BT unexpectedly offering the best), and the Sony WH-1000XM2 wireless cans pulled in big interest thanks to a deep discount. How does TechRadar prepare for Black Friday? Black Friday is one of the most important times of the year for TechRadar - we spend weeks ahead of the big day (or weekend) making sure the whole site is ready for people looking for the information they need to help them make the right buying choice. Whether that's knowing which is the best laptop, TV or iPad, or just seeing great deals for them through our Hawk price comparison widget, we've got everything you need to know. Nintendo Switch bundles once again outshone PS4 and Xbox One X and One S deals, and in the TV world a great deal was seen on a top Sony 4K TV, slashing hundreds off the price of the 43-inch TV. In the phone world, there were a few decent bargains in the iPhone XR bundles, but an ‘everything unlimited’ SIM only deal from Three - for just £20 a month - was the real star of the show. Well, that and the insanely cheap £19-a-month deal for the Samsung Galaxy S9 as well - both were excellent options. In addition to its usual discounting, Amazon will always lop a sizable amount off its own products on Black Friday: it offered impressive discounts on Fire tablets, Kindle e-readers and its Echo devices last year, as we well the Ring series of tech from the brand it now owns. Getting this powerful little smart speaker for half price was a pretty good deal in our books – with the smarts of Amazon Alexa, far-field voice recognition, and the ability to control your smart home, the Echo Dot is mightier than it looks and was a great deal last Black Friday. We’re not expecting the Black Friday / Cyber Monday bandwagon to slow down in any way this year, with retailers extending their deals even further than before to entice the buying public. In 2018 we saw a couple of brands promise to ‘future price match’, meaning consumers could buy something now and know that if it got dropped in later wars to offer the cheapest tag, they could reclaim the difference. However, despite all this we’re still expecting that the best deal will be found surrounding Black Friday - as ever, our advice is to know your budget going in, set a maximum price you’re willing to pay (having done the research to know what sort of prices your desired tech has been at throughout the year) and stick to it. Not to be too self-promoting (OK, a little bit, but we really put the effort in here…) but TechRadar’s Black Friday and Cyber Monday deals pages are really worth keeping an eye on if you’re looking for the very best deals in tech. Where will we see the best Black Friday deals? One thing we’ve noticed over the years is, in many cases, the available discounts changed as the month of November progressed: headline-grabbing stuff aside, the best value deals tended to appear later in the month on more expensive products where retailers could still make a profit while knocking a hefty amount off the price. That’s partly due to upselling and cross-selling opportunities too: many firms hope if you buy something expensive for a bargain price, you’ll then buy some accessories to go with it. But what technology should you be looking out for? These are our top predictions if which desirable gadgets you’ll be able to get for less. The last couple of years we’ve seen decent discounts on the ‘new iPad’ (the non-Pro model), with 2018’s version getting insane price drops in the US to just $249. It was so good that our US Phones Editor instantly bought two for his parents. Apple hasn't brought out a new low-end iPad this year, which is great news for consumers - that means the iPad (2018) will likely get an even bigger discount, and the new iPad MIni (2019) and iPad Air (2019) which did launch will get nifty drops too from various retailers, we reckon. Note that this isn’t from Apple, but the retailers themselves - Apple only usually offers extra gift cards when you buy expensive gadgets from it. The iPhone XR was one of the biggest sellers in 2018 as well, with discounts appearing instantly on contract even though it was a newer phone. This year we expect the iPhone XR sequel to come out a little earlier, which means it’s even more likely to be part of the Black Friday sales this year. Sticking with the Apple theme, we’re very much expecting retailers to realise that there’s a lot of money to be made from discounting Apple’s wireless headphones - they were among the most searched-for items on Black Friday last year, and we've now had the imprived Apple AirPods (2019) land, although they're not as exciting as the Apple AirPods 2 we expect to see in 2020. That said, this year's AirPods will still likely get a discount as there's not a huge amount new inside, so the price could well plummet. As with iPhones, so with Galaxies: not just the S10 but the new Note too. We saw low-cost up-front deals with very little to pay per month for the Galaxy S9 and siblings - which was impressive for these well-reviewed phones - and we’re expecting to see the same this year. If your contract is up for renewal around then, it’s worth waiting for Black Friday to see what cracking deals emerge. We’re still waiting for news of the PS5, but right now Sony is still all about the PS4 and the PS4 Pro and Microsoft continues to push its Xbox One S and One X deals to extend the ecosystem and get more people to buy its games and peripherals. It’s in the bundles that we expect to see some good deals - although there weren’t as many sensational options last year (apart from some to include Red Dead Redemption 2), we always expect good bundles. The same can be said on things like PSVR - last year saw some discounts there too, and we’re still seeing games come out of the platform, so the virtual reality discounts are still highly likely. For TVs, using tools like PriceSpy or CamelCamelCamel is perfect, as you’ll really want to know the true previous price for the large sets. Every year TVs are one of the big winners in terms of discounts - there’s usually something for everyone on offer, with low-cost 4K TVs something many retailers offered last year. We often see discounts on LG’s OLED range, one of the more popular in the UK especially, and OLED technology is dropping in price every year, making it far more of a bargain. We're expecting the LG OLED B9 and C9 to be really big hitters once again. You can also look into Samsung’s QLED TV - it’s meant to be the equivalent of OLED tech in many ways - or top-end LED TVs if you’re looking to spend a little less, and cost a lot less than before - we’re talking less than £500 in the UK for a 55-inch set in some situations. We also saw some sub-$100 prices for Full HD 40-inch sets in 2018 over in the US, which is an insane price for a TV, even if the quality is less than you might expect at a higher price - there could still be one final hurrah for 1080p sets, perfect for the second bedroom or kitchen, in 2019. It wouldn’t be Black Friday or Cyber Monday if Amazon wasn’t slashing the price of its own-brand devices. There were multiple cuts to Amazon’s top tech in 2018, with the Echo Dot getting 50% off, the Ring series of smart home tech also being cut and Philips Hue bundles getting chucked in with the top-end Echo speakers. In fact, we’re expecting multiple smart home speakers and displays to be discounted again in 2019 - Lenovo and Google had high discounts on their top speakers last year, and the same is almost certain to happen again in order to pull users into the relevant ecosystems. Black Friday is the Friday immediately after Thanksgiving when retailers begin the holiday shopping season. It’s based around the aforementioned “doorbusters”, discounts so impressive that bargain-crazed customers will try to break the doors down before the shop opens - although that’s more of a virtual craze these days. What’s the origin of Black Friday? Let’s take a Black Friday history lesson: the first known mention of Black Friday related to this shopping experience was in November 1951, when the journal Factory Management and Maintenance used it to describe people calling in sick the day after Thanksgiving so they could have an extra day off work. At the same time US police were using the phrases “Black Friday” and “Black Saturday” to describe the horrendous traffic that occurred at the beginning of the pre-Christmas shopping season. In 1961 there was a movement from the local government to change the shopping season to “Big Friday” and “Big Saturday”, but it clearly never caught on. The term was coined by Ellen Davis and Scott Silverman of the US’ National Retail Federation and Shop.org, and it was a deliberate move to promote online shopping back in 2005 when the Internet was made of wood and powered by steam. It was intended to help smaller retailers compete with the big names who were harping on about Black Friday, although of course those big names promptly jumped on the Cyber Monday bandwagon too. Are Black Friday deals and Cyber Monday deals real? Generally speaking, yes - although there are two kinds of deals. The first has been pre-agreed between brands and retailers, so they’re not as off-the-cuff as you might expect. The other is sudden price drops, whether that’s an algorithm working out the best way to attract users to buy (as brands like Amazon often will) or just the big names price-matching one another, or pushing the price down further as they look to be the big winner. (We saw something similar with iPads in the US and AirPods in the UK last year). As with any sales event you’ll see a mixture of bargains, discounted end-of-line stock and strange things found in the back of a warehouse somewhere. In 2016, consumer magazine Which? accused retailers of some pretty dodgy behaviour. Where can I find the best Black Friday and Cyber Monday deals? As mentioned, you’ll find the best options if you bookmark this page right now - there will be deals from the beginning of November, and we’ll be bringing you the best of them, those that we think are worth checking out, the second that we see them flash up. Where are the best Black Friday and Cyrber Monday deals in 2019? Homework really helps. Some retailers up prices from August through to October so they can offer supposedly amazing discounts on Black Friday and Cyber Monday, so don’t be fooled by such moves. They’re particularly prevalent in expensive consumer electronics such as TVs or laptops with product numbers rather than names, with products that were dropped down to a great bargain price suddenly being pushed back to their RRP again. It’s also a very good idea to be flexible: for example, if you fancy a Samsung UHD TV it’s best to think about the features you want rather than a specific model number: the BRV553ABD34-82C-9218-X may not be discounted on Black Friday 2019, but an almost identical set with the specification you want probably will be. So do your research on what matters and we’ll do our best to give you the right comparison needed. However, don’t be fooled into thinking that something that looks like a five star set is the same but cheaper - certain elements (often with regards to screen quality or image processing) won’t be as high quality to achieve that lower price point. Sometimes, yes. Your debit card or credit card may offer cashback on purchases, and cashback websites such as Quidco often offer cashback for new customers of big-name online shops. It’s definitely worth looking into, not just for Black Friday 2019 and Cyber Monday 2019 but for any online shopping, when you’ll be spending the most online. Am I protected on Black Friday and Cyber Monday? In the UK, yes. Anything you buy from a company online is covered by a wealth of consumer protection legislation including the Consumer Contracts regulations, which give you the same rights as with any other online purchasing. However, be aware that it can be difficult enforcing the regulations if the company you’re buying from is located outside Europe. Remember that using your credit card also can offer a level of protection, so as long as you have the means to pay it back straight away, using this method can give you more peace of mind.